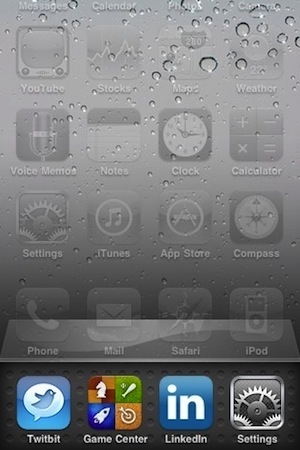 Multitasking is coming to the iPhone in just a smattering of days as part of the new iOS4 operating system. But it requires some re-programming on behalf of any app that needs to use it. Need we worry that app writers won’t be ready in time? Over at PocketLint they’re running a story with the eye-grabbing headline: “EXCLUSIVE: iPhone 4 multitasking – massive delays expected.” The main thrust of the piece is that “currently,” according to PocketLint’s testers, “only Apple apps, like the Clock, Mail and Safari, can multitask. That’s it!” While the launch of iOS4 may only be a handful of days off, the contention of PocketLint is that it’s going to be bloody ages until developers get on with the job of building multitasking powers into their apps–if ever. Why the worry? Because multitasking on the iPhone doesn’t work like multitasking on a normal computer, where several apps just keep running, regardless of whether you’re currently looking at their window or not. To keep the battery-sapping demands of such a system to a minimum, iOS4 operates a pseudo-multitasking system which has several levels of keeping a task “running,” even if it’s not the one currently filling your iPhone screen. To make this work, Apple’s had to build in special multitasking code “hooks” in its OS so that apps can tell the iPhone exactly how they want to manage themselves while running in the background. To make the most of this, apps need to actually use these hooks. Which means they’ll need to have extra code added in. PocketLint is concerned that many app writers won’t do this speedily, so users’ experience of multitasking will be unsatisfying. There are several problems with the argument, however. Of course PocketLint’s test for multitasking didn’t reveal many compatible apps: iOS4 isn’t officially released yet, it’s still a test version. Taking note of this, many app writers won’t release updates to their wares until it’s officially out, since the odds are they’ll take the opportunity to release upgraded apps with a few other extras, as well as a mulititasking system. Why take the time to fix the code and go through the official app submission process without also chasing down bugs and adding in new features to tempt more users to buy your wares? PocketLint also hints that Apple’s been somewhat misleading on this, that many apps won’t be able to multitask anyway and that it’s not “true” multitasking. Thing is, there’s no big secret: multitasking on the Android platform isn’t quite “true” multitasking either (and Win7 won’t have it at all). Apple has, right from the start, made it clear that only certain classes of app will be multitasking-enabled, (apps like GPS or VoIP ones for example) and then only under certain circumstances, so that they don’t secretly sap your battery. But the system is going to be extremely useful, and it will slightly change how you interact with your iPhone. When it hits the iPad, its effects will be even more noticeable as it’ll help this larger device be a more potent generator of content, instead of a mere portal to consuming it. And as with all these rumors there’s one huge thing to remember: while buyers of the iPhone 4 will get iOS4 instantly, Apple updates this OS for free (as does Google for its Android platform) regularly for existing iPhone users. This means Apple effectively upgrades, uprates, tweaks and improves your smartphone for free in a way that’s likely never happened for any phone you’ve owned previously, where to achieve the same benefits you’d need a whole new phone. If you really need to complain about this, then perhaps you’ve missed the point.